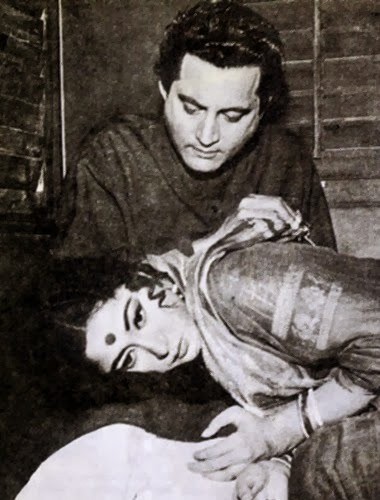 The credit titles of the Guru Dutt produced and Abrar Alvi directed Sahib Bibi Aur Ghulam (1962) list three playback singers – Asha Bhosle, Geeta Dutt and Hemant Kumar (Hemanta Mukherjee, also the film’s music director). However, on viewing Sahib Bibi Aur Ghulam, there is no song in the film by Hemant Kumar. Of the seven songs present in the film, four are rendered by Asha Bhosle (Bhanwara Bada Nadan, Meri Baat Rahi Mere Man Mein, Meri Jaan O Meri Jaan and Saqiya Aaj Mujhe Neend Nahin Aayegi), while Geeta Dutt has sung three exquisite numbers for the ‘Chhoti Bahu’- Koi Door Se Awaaz De, Piya Aiso Jiya Mein and Na Jao Saiyan. Hemant Kumar did, in fact, record a song for the film, written by Shakeel Badayuni, which was edited out of the film. The song, Sahil Ki Taraf Kishti Le Chal, was filmed in a scene towards the end of the film where Chhoti Bahu (Meena Kumari) and Bhoothnath (Guru Dutt) are together in a carriage in what would prove to be a fateful outing ending with the abduction of the former. They are together since Chhoti Bahu has asked Bhoothnath to accompany her to a shrine to pray for the health of her paralyzed husband (Rehman). During the course of the song, Chhoti Bahu rests her head on Bhoothnath’s lap. However, when the film released, there was strong public disapproval of this scene. 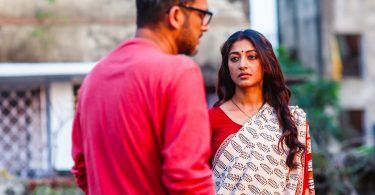 Audiences resented the filmmakers showing a married woman behave in what they thought was an intimate manner with a man, who is not her husband. Never mind the special bond shared by the two, even if platonic. On seeing the strong reaction at Minerva cinema towards this scene and another where the alcoholic Chhoti Bahu asks her husband for a last sip of liquor, promising to give it up completely thereafter, Guru Dutt deleted these scenes from the film. 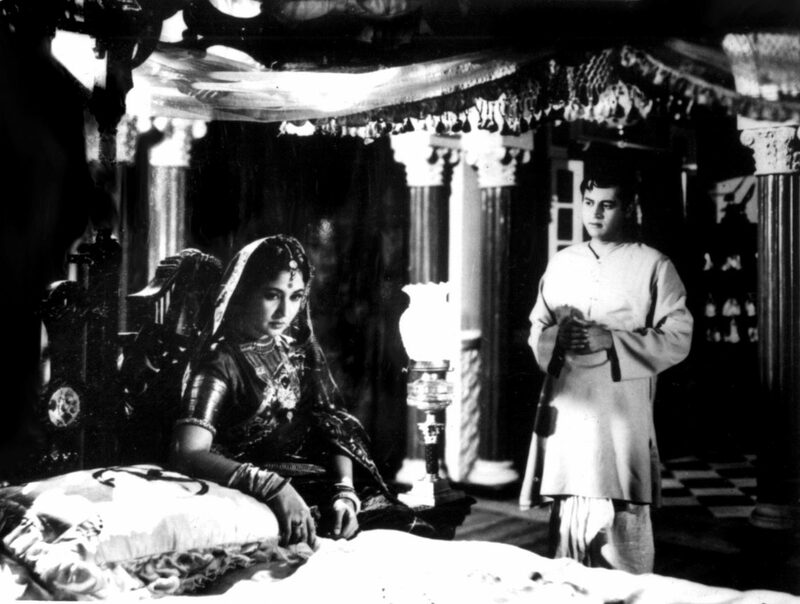 Guru Dutt and Meena Kumari in the deleted shot from Sahib Bibi Aur Ghulam. Photo courtesy Arun Dutt. To make up for the gap in the film’s story, however, he called Meena Kumari, who was away in Lonavala, to return to Bombay and come to the sets the very next day. According to Nasreen Munni Kabir’s landmark book, Guru Dutt: A Life In Cinema, the carriage scene, following the removal of Sahil ki Taraf…, was changed and reshot to feature, instead, a dialogue exchange between Chhoti Bahu and Bhoothnath. Another scene was also filmed showing the paralyzed Rehman repenting for his debauched way of life. These sequences were then inserted into each and every print of the film. Guru Dutt was a hard taskmaster and was known for removal and even deletion of scenes or songs if he felt there was even the slightest problem affective the narrative flow of the film. In Sahib Bibi Aur Ghulam, the haunting Geeta Dutt solo, Koi Door Se Awaaz De Chale Aao, is used in a shortened form with the entire second stanza edited out. Thankfully, a version remains for us to hear the entire song as it was originally recorded. And as for Sahil Ki Taraf…, it wasn’t a total loss for music lovers, thankfully. Hemant Kumar reused the tune in Hrishikesh Mukherjee’s Anupama (1966). The newly worded song written by Kaifi Azmi, Ya Dil Ki Suno Duniyawalon, sung by the composer himself and picturized on the film’s leading man, Dharmendra, proved to be one of the highlights of the film. Header photo courtesy Arun Dutt. I was fortunate to have seen the song in the first week of the film release. I found it a very well pictured song. As usual Guru Dutt (Abrar Alvi) cinematic capturing of the song kept you glued to the same. The carriage ride in which Guru and Meena Kumari travel was very melancholy and evokes a lot of sadness. Will this clip be available with the archives?